Imagine a perfect egg cooked medium-hard: a soft and creamy yolk just bordering on runny, delicious with a grind of black pepper and a sprinkle of salt. Crack it over a big plate of roasted vegetables with some crispy bacon and dig in at any time of day! Now imagine a different egg, with a yolk even richer and even bigger relative to the white – if the chicken egg is a very serviceable Honda, this is the Cadillac of eggs. It’s so luxuriously good you can barely believe it’s healthy – but in fact, it’s even more nutritious than its smaller, paler cousin. And best of all, this delicious gift of nature is actually quite widely available and getting increasingly popular: it’s a duck egg. (The percentage listed is the % Daily Value, which isn’t perfect, but works well enough to give you an idea of what kind of numbers you’re talking about). *There is currently no %DV for choline or Omega-3 fats. Duck eggs win hands-down, probably because proportionally they have much more yolk (where all the nutritional goodness is) and much less white (which is just empty protein). More micronutrients, more protein, and more Omega-3s. Choline is incredibly important for liver health: there’s some evidence that fatty liver disease is very closely connected with choline deficiency. 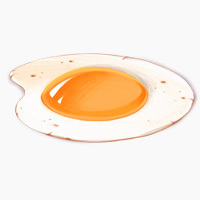 Egg yolks are a staple dietary source of choline (if you don’t eat organ meats, they’re probably by far the biggest source of choline in your diet), and duck eggs simply have more. Folate, or Vitamin B9, is especially important for mental health, pregnant women and nursing mothers. 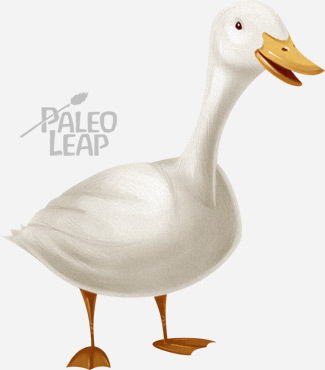 Eggs are a key source on Paleo because many other sources – like beans and lentils – are out. One duck egg has over twice as much folate as one chicken egg. Duck eggs also have other benefits as well. The whites of duck eggs may have different proteins than the whites of chicken eggs, and some people can tolerate duck eggs even if they can’t tolerate chicken eggs. So if you’re struggling to find good breakfast options, check with a doctor to see whether duck eggs might be a better alternative for you than chicken. It’s also worth noting that duck eggs are still a specialty food sold primarily by people who really care about food quality. This means that the ducks that produce duck eggs are rarely fed soy or wheat: if you’re sensitive to even the slightest trace of these things in the eggs, duck eggs are probably a safer choice. OK, that’s all good, but where does anyone actually find such a strange and exotic food? Actually, duck eggs aren’t so rare; you just have to be on the lookout for them. If you’re not aware of them, it’s easy to skip right over them, but once you’re looking, they’re not hard to find. The best place to get duck eggs is from a farmers’ market. A lot of smaller poultry farms like ducks for various reasons (they’re hardier than chickens, they eat unwelcome insects and help with pest control, and their manure is more useful for the rest of the farm). Farms that raise ducks for meat will often sell the eggs as well. Many higher-end grocery stores, like Whole Foods, also carry duck eggs; you just might have to search a bit through the rows of chicken eggs to find them. Sometimes you can even buy each individual egg separately, which is nice to get a preview without shelling out for the whole dozen. Local co-ops that get food directly from farmers are also a good bet. Because they’re larger than chicken eggs, duck eggs are likely to be more expensive per egg. But you’ll probably also need fewer duck eggs to make a meal, because they’re fattier and more filling. All in all, it usually works out to roughly the same price per egg-based meal, or even a little bit less. So, you’re now the proud possessor of a dozen (or half a dozen; often you can get half-cartons to try) duck eggs! Now what? Hard- or soft-boiled, fried, or scrambled duck eggs are great: make sure to leave the yolk a little soft so you can get the most out of that creamy texture! Any seasonings that go well with chicken eggs will also be good with duck. Salted duck eggs are a traditional staple of Chinese cooking. Salt-cured egg yolks are a delicious way to make something “cheesy” without the cheese. Duck egg mayonnaise: if you thought mayo couldn’t get any better, you thought wrong. Ducky coconut flour biscuits: baking with duck eggs isn’t just for unhealthy food! You could also make any kind of frittata or omelet with duck eggs just to enjoy that rich, delicious flavor. You can eat Paleo without ever touching a duck egg, but it’s always nice to have luxuries, and duck eggs are a great way to give yourself a treat that’s also a true “treat” for your health. They have a much richer flavor and a creamier yolk than chicken eggs, with roughly twice the nutrient content to boot – and you can cook them just about any way you’d cook any other type of eggs. Why not give them a try?